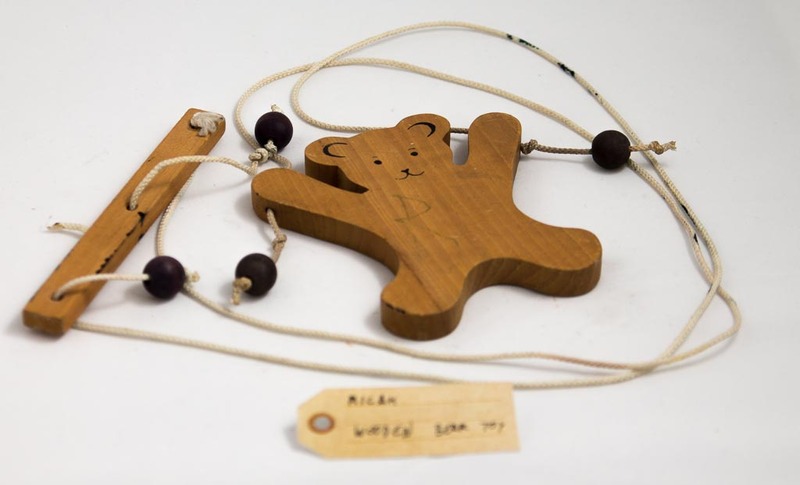 Wooden bear toy | That Belongs in a Museum! This is the oldest thing I ever remember playing with as a child. It’s a little bear [that] slides down [the rope] and you can pull the strings [to make the bear climb up]. It hung on my wall for as long as I remember being alive, and very faintly on this side there is a letter “R” which I scribbled on it one day to indicate that the “restaurant”, [that] I was running out of my room, was open. Ever since then I have regretted writing it [the letter R] on the side with the face; there’s no reason to scribble on the side with the face with the features of the bear, and I always got a little mad at myself looking at it, wishing I had thought my plan for this restaurant sign though a bit better.